Remember 9mobile (formerly Etisalat) super bonus offer tagged Revamped? This is another version of the awoof tagged Heavyweight. This promo is exclusively for new customers. 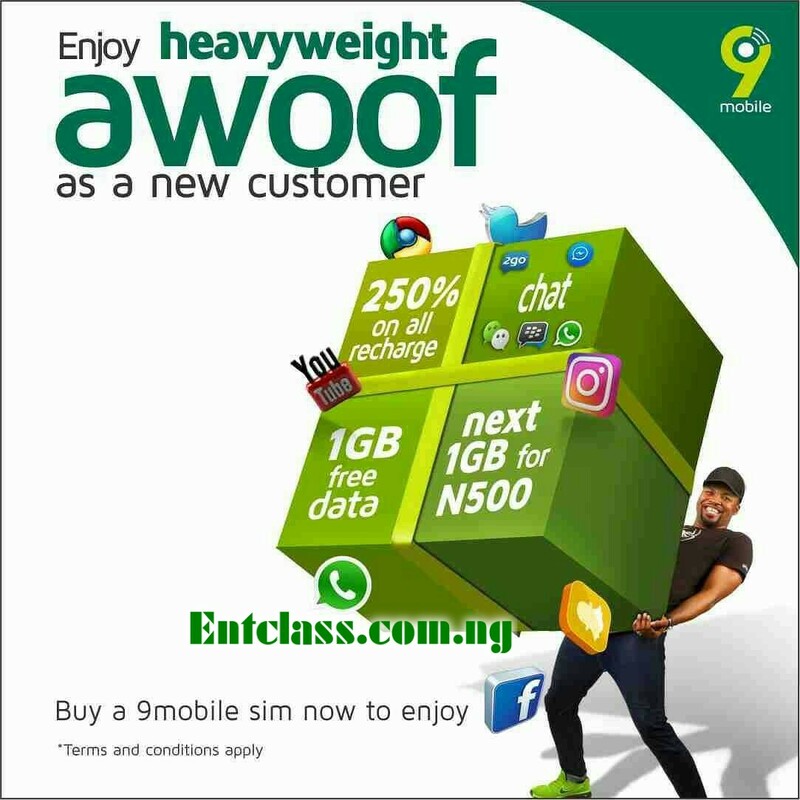 If you are an existing customer, then you have to get a new 9mobile sim inorder to enjoy this heavyweight awoof from 9mobile. With 9mobile heavyweight awoof, you will get a whooping 250% the value of your recharge, 1GB preloaded, and free chatting on every social network sites/apps. If you are already a customer, you will still enjoy 7 times the value of your first daily recharge to call any network in Nigeria for 30 days. Just dial *819*1#. But I would advise you to dial *545# to enjoy 250% value of your first recharge daily and 100% double data bonus on selected data plans. OR Reply with 3 to get 100% double data bonus on selected data plans. 1GB preloaded data to browse. You only enjoy the awoof once. Meaning after first recharge or data subscription, subsequent ones will be charged at normal rate. After that, you can now buy airtime and get 10 times value of your first daily recharge, free 1GB data and free access to social media sites/app for 30 days. For instance, when you recharge N100, you get N1000. When you recharge N200, you get N2000. That's how it goes. What do you think? Please comment and share. I hope this Promo is for New customers only... What if I retrieve my lost sim to get this Offer? I don't really think this would work for welcome back users. The call bonus is very deceptive, the only real value there is the data bonus. 9mobile is trying, today when subscriptions are very high and cost, one can still be managing this.